Last season represented a nice step forward for the Detroit Pistons as they improved by 12 wins to secure the eighth and final playoff spot in the Eastern Conference — the team’s first postseason appearance since 2008-09. Of course, the result for the Pistons was exactly the same as their last playoff showing — a four-game sweep at the hands of the Cleveland Cavaliers. So now the question heading into this season is can Detroit build on its 44-win campaign and perhaps even snap its 10-game playoff losing streak? We’ll start to find the answers to those questions when coach Stan Van Gundy’s boys kick off their schedule on October 26, in a great test against Toronto — one of the top teams in the conference. 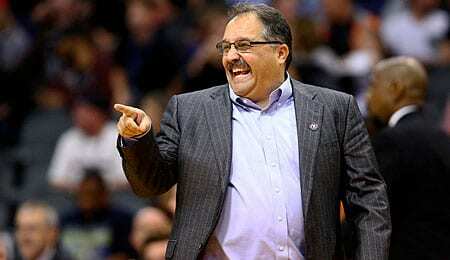 SVG, by the way, seems to be quite loved by his players, if the video below is any indication. Two-thirds of the roster returns, including key building blocks Kentavious Caldwell-Pope, Andre Drummond, Tobias Harris, Stanley Johnson, Reggie Jackson and Marcus Morris. Notable newcomers include first round pick PF Henry Ellenson, PF Jon Leuer and PG Ish Smith. The only notable departures are backup point guard Steve Blake, SG Jodie Meeks (who missed almost all of last season, so was really a non-factor) and backup PF Anthony Tolliver. Drummond, named to the All NBA third team last season, is now the team’s cornerstone. The centre is such a physically dominant defensive presence, but the key for him taking the next step offensively will have to come through improved free throw shooting. Drummond keeps getting to the line more each season, but his work there keeps degrading (35.5 per cent last season). He’ll never be a 20 PPG player until he can address this deficiency, but remains a Fantasy staple because of his boards (his work was a big reason why Detroit was the NBA’s second best rebounding team last season), blocks, steals, points and FG percentage. Another key to Detroit taking the next step is sophomore swingman Johnson’s ability to become a more efficient offensive player. The eighth overall pick in the 2015 draft failed to secure the starting SF spot last season because of his poor shooting, but is expected to see time at SG, SF and PF this season, making him a versatile option off the bench. Johnson is a bit of a sleeper depending on how much more PT he gets and if his shooting touch can come around. Jackson has been the Pistons’ starting point guard since escaping his role as Russell Westbrook’s understudy in OKC and arriving in Detroit in a three-team deal in mid-February 2015. He really broke out last season, becoming a more prolific scorer from outside, although his rebounding numbers dropped significantly compared to his first season in Detroit. There could still be upside in Jackson’s game, and he’s become a leader on this young squad, although it’s worth noting that there’s rumour circulating that he’ll be packaged up in a deal to Washington to land John Wall. Harris took over as the SF last season after arriving in a deadline from Orlando. His touches were down with the Magic, but he stepped up his game in Motown and never looked better with his outside shooting. Again, there’s serious upside here. Two guard Caldwell-Pope is entering his fourth season, and he’s showed progress in each of his previous campaigns. His shooting touch keeps getting better, and while he didn’t can as many treys last season, he did do a better job of getting to the charity stripe. Ditto on the upside potential for KCP, which is why Detroit is talking to him about a contract extension. The Pistons’ oldest player is backup centre Aron Baynes. His shooting touch regressed in his first season in Detroit, but he’s such a physical presence, so is an ideal guy to spell Drummond. Another newcomer last season was Morris, who took over as the starting four. He enjoyed a career season and even showed a better passing touch as his overall game continues to grow. Given how young this team is, Detroit will look to five-season vet Morris for some leadership this season. One of the issues facing this team is that it lacks a superstar. Drummond is a fantastic, but still somewhat flawed player. It seems in today’s NBA, the elite teams all have at least one go-to player; often a couple of them. Detroit has some budding young talent, but can that be enough to overcome the lack of star power? We see the Pistons as a growing club, one capable of repeating last season’s win total and possibly getting back to the playoffs, but unlikely to make much noise once it gets there. Still, it wouldn’t actually be a major shock if this team falls a bit short in the playoff chase. The bench looks deeper this season, but as things stand, the overall talent is lacking. Now, if several Pistons make the leap this season — especially from an offensive efficiency perspective — we may be onto something here. Now it’s your turn. Let us know in the comments below how you see the Pistons’ season playing out. This entry was posted on Sunday, September 25th, 2016 at 10:55 pm	and is filed under BASKETBALL, RotoRob, Team report. You can follow any responses to this entry through the RSS 2.0 feed. Both comments and pings are currently closed.